Your kadhi looks so yum and thick. Sometimes i make it with methi. Hey! you are doing a wonderful job by just being you - a good human being! Do you know how little there are of that species these days ?! I lobe kadhi and usually make it with veggies, but never heard of this with spinach - a must try! I love jamie and my hubby hates him and i tell him that is because he is jeamous bcaus i like the young jamie from the time when he started cooking. I too jope you feel better and i am sure after eating this dish you are feeling much better. palak kadhi ..onek noton rokom er dish ..and eating healthy is very essential ..schools in England have proper meal plans and I haven't come across obese kids in my daughter's school ..I think obesity is catching up in Indian metroes like anything ,ready-made foods onek easily availale and going to big Mac is in trend these days..
keno eyi rokom feel hoye..just be happy and feel good, tumaar onek fan following ache ;)...aro onek kicho likhte pari ..kinto eto open e likhbo na..kushi apne andar se hoti hai , hum ose kyon bahar dhonte hai..just think.. I have marked it on my calendar(if one exisits, the busy person that I am!?) to watch Jamie's show. I thought the first show was this friday, I'll catch the earlier ones on Hulu. I get the same anxiety your DH got now and then, ask DD2 to name the vegetables when she comes grocery shopping with me. Before I forget that Palak Kadhi is indeed delicious and easy to make, now that I am a kadhi expert. Sad the people that don't have access to fresh vegetables and even sadder are folks who eat packet dinners for convenience. Hey we all get bogged down sometimes and have a hard time choosing to be positive dear....SO you need to shift the focus elsewhere. Try to appreciate little things in life.....believe me erokom bhable shottyi khoob halka lage nijeke....Ami o chakri charar por nijeke khoob useless feel kortam ar kichu e bhalo lagto na tar por yoga, hobbyclasses join korar por there was no looking back. So cheer up!!! ami kadhi khoob pochondo kori. Tadka te hing ,methi aro onek kichu add korte bhalo lage. Next time spinach diye try kore dekhbo. My mom was telling me about that show, I could hardly believe it! It's awful, being overweight and malnourished at the same time! The gravy looks yum! U sound low key, is that a April fool prank like Topeka or the wet weather? The spinach in yogu is something new! I cook kadhi a lot, but am not too fond of a heavy pakora wali kadhi. This sounds like something I am going to like. 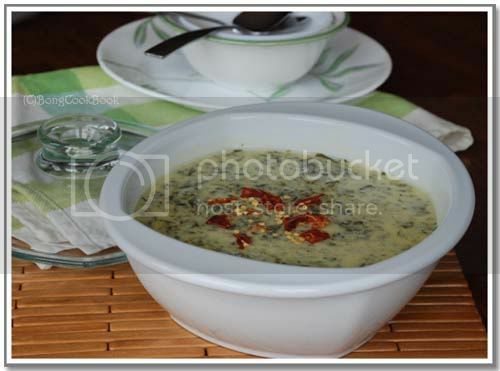 Palak kadhi is one of my fav'...best way to eat greens. Makes me shudder to read it. School children in some states get midday meals here, supposed to be freshly cooked, but of course, they have their own flaws! Yet another beaut recipe to try.Am going in search of some spinach.What does kasuri methi really do?Does it make a difference to the taste?Then I must search for that too.Love Jamie and waht he is doing. I used to watch Jamie Oliver way way back then, but now I have totally lost touch. Love yogurt based gravies, but I mess it when it is heated. Simple ingredients and simple process make heartening food and this is another example. Haven't combined curds with any greens till now. Will give this a try! I found it to be shocking even in India the culture of buying frozen food has started to root everywhere and I find my neares "foodworld"'s frozen section constantly being updated! aami just notun notun ranna sikhchi and its gr8 doing your Palak kadhai aamar ma super impressed hoye gailo :)lol ..
Oh yumm..i love kadhi..i should try this soon! OMG!!! Donuts for bkfast and pizza for lunch??? Is that for real? Scary! Even here in India, people have started talking about childhood obesity. Something that was unheard of a few years back. Hey Sandeepa, I was completely off blogging for a month and a half. 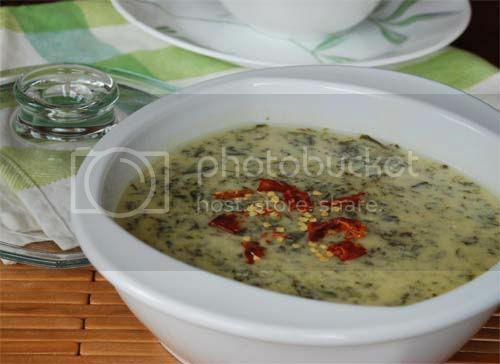 And I returned today with guess what - palak ki kadhi! Decided to catch up on some of my favourite blogs and reached here! Realised that we have similar recipes, with a slight difference in spices. Hope things are going fine with you. Am still to post on the Paneer Kofta Pulao... hope to do so soon. This was a great dish. Thank you. Hey San, we're still here in Bangalore. Moving mid-March now. And not to NJ but to Collierville, TN. In a way I'm glad coz it's a new part of the country for us and I have that to look forward to. Packing, sorting etc going on. Will keep you posted. You in India now? Saw your Vinod Dua comment. klbuugelsofjtglatbdnsaxxilh, Text Your Ex Back, ebeoruycg, [url=http://gomaflex.com/]Text Your Ex Back Review[/url], dZIeigygl, http://gomaflex.com/ Text Your Ex Back Reviews, mlJgvwhzt, Text Your Ex Back, kxPdtKuPJ, [url=http://reddigg.com/]Text Your Ex Back Review[/url], RfPEJjdKf, http://reddigg.com/ Text Your Ex Back Reviews, PMmhBoWoH, Text Your Ex Back, meJbdWMQC, [url=http://hypotheekaflossingsvrije.net/]Text Your Ex Back Review[/url], XYNkSxhCv, http://hypotheekaflossingsvrije.net/ Text Your Ex Back Reviews, yxDmvgjxo, Text Your Ex Back, bBUTrhwgp, [url=http://camping-cote-atlantique.com/]Text Your Ex Back Review[/url], BLXWQCLVz, http://camping-cote-atlantique.com/ Text Your Ex Back Reviews,KxPtvplSD, Text Your Ex Back, LdXtvvxEB, [url=http://mobilis-tv.com/]Text Your Ex Back Review[/url], VomvszLbt, http://mobilis-tv.com/ Text Your Ex Back Reviews, GqFYrjJQk.